Internationally renowned cardiologists Drs. 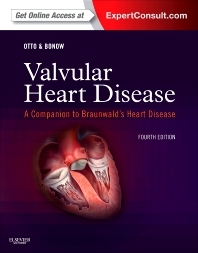 Catherine M. Otto and Robert O. Bonow help you to apply all of the latest scientific knowledge and clinical strategies with Valvular Heart Disease, a companion to Braunwald's Heart Disease. This indispensable resource for your everyday practice provides all of the knowledge you need to give your patients the most accurate diagnoses, the best possible heart disease treatment options, and the expert care they deserve. Apply today's best medical and surgical approaches with comprehensive, expert guidance on today's full range of clinical heart disease treatments. Provide appropriate care to pediatric and pregnant patients with focused chapters on the unique needs of these special populations.